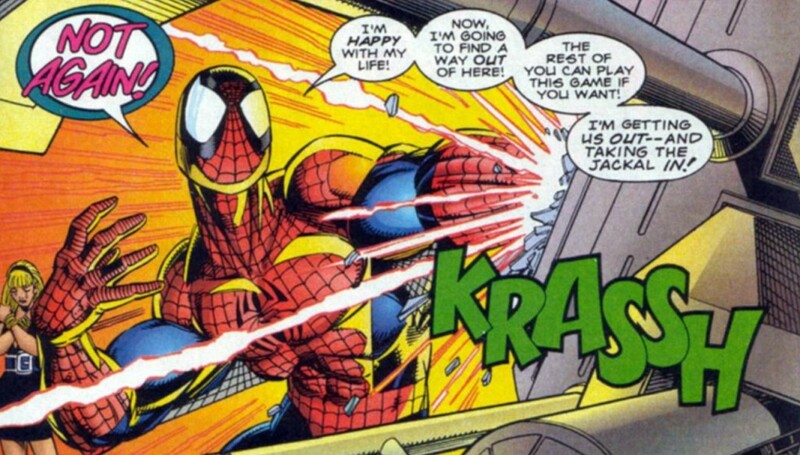 If you thought I was done with my “Clone Saga Callback” series just because I never wrote about the “Web of Death” storyline in which Doctor Octopus saves Peter Parker’s life before getting murdered by the mysterious Kaine, think again. I actually wrote about “Web of Death” two summers ago when the storyline was revisited during a Scarlet Spider/Superior Spider-Man Team-Up crossover. So in continuing with the 20 years ago this month theme of the series, I’m going to look back at “Smoke and Mirrors,” a three-part arc that was featured in Web of Spider-Man #122, Amazing Spider-Man #399 and (adjective-less) Spider-Man #56. For you history buffs out there, “Smoke and Mirrors” marks the long-awaited (??) return of Professor Miles Warren as the Jackal who was believed dead at the end of the Amazing Spider-Man #149 (the same issue in which Peter’s clone allegedly died — so at least his resurrection here is not without precedent). 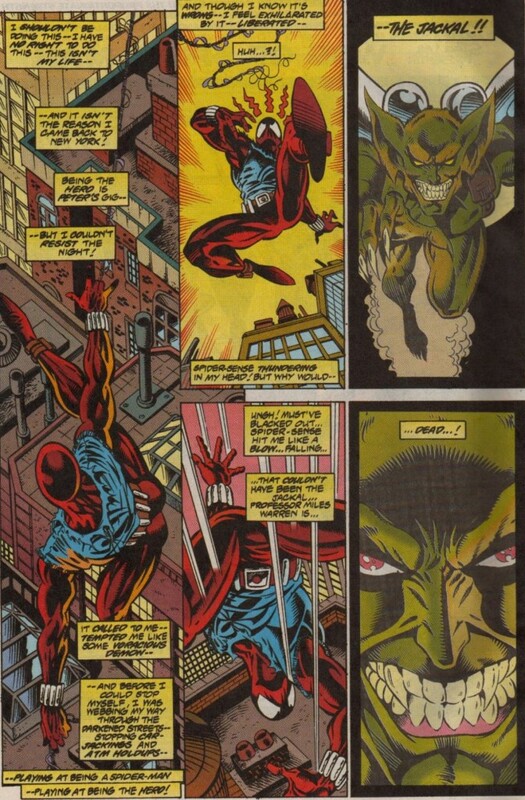 A clone of Miles returned as the undead Carrion in an underrated arc from Bill Mantlo in Spectacular Spider-Man in the late 1970s (I touched upon the first two parts of this storyline during a write-up about Frank Miller drawing Daredevil for the first time in a Spidey comic), but “Smoke and Mirrors” was a full-fledged back from the dead moment from Warren, and began the Spider-Man trope of Jackal having so many clones of himself out there that he became essentially un-killable. 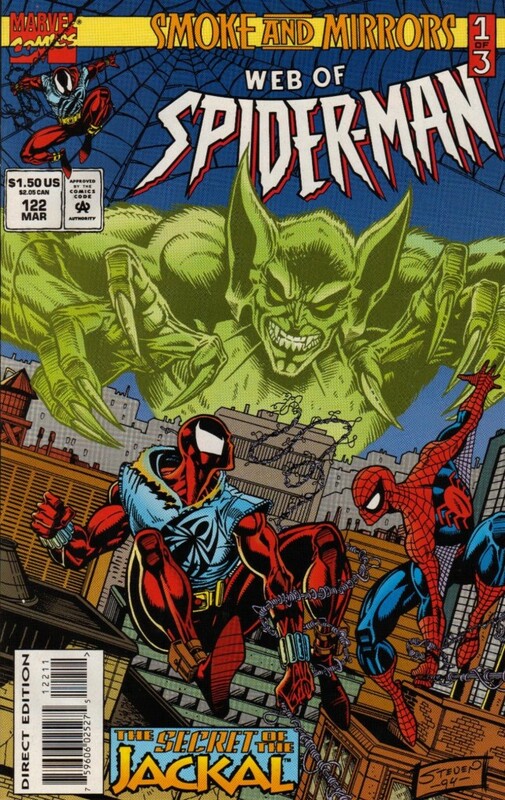 It’s funny, “Smoke and Mirrors” is definitely one of those arcs that, in hindsight, has proven to be problematic, embodying all of the silliness and excesses that went on to define the “Clone Saga.” But I remember very definitively that in 1995 when I read this storyline for the very first time, I was quite intrigued by it, so much so that I actually owned two copies of ASM #399 (a little memory I blogged about in this post a few years back). Jackal, for as irritating and exhausting as the character would become, was the featured villain in the very first ASM back issue i ever purchased, and I thereby had a special fondness for him. When you add in the “return” of Gwen Stacy (who of course ends up being another clone, but the creative team definitely baits you for a bit there that maybe she’s back from the dead as well), and there was a total “anything could happen” vibe to the Spider-books at this point in history that grabbed me as a teenager. 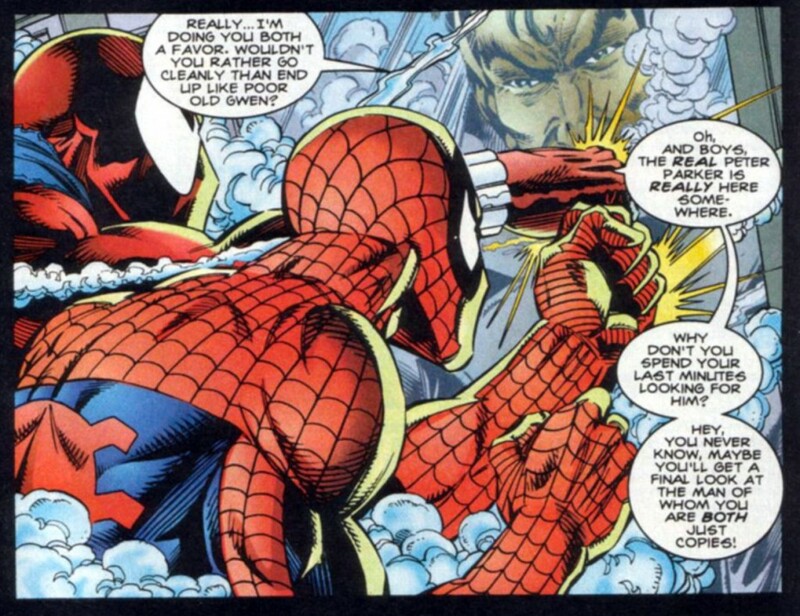 While other stories had hinted at the possibility that Ben wasn’t actually the clone but was instead the real Peter Parker who had the misfortune of being the loser of the Spider-Man vs. Spider-Man fight in ASM #149, “Smoke and Mirrors” is the first storyline in the “Clone Saga” to unequivocally suggest, “everything that you’ve been reading about for the past few months is not as it actually appears.” That alone, makes this storyling quit daring and unique, though the intrigue and suspense it manages to create is also due in large part to the people who crafted this specific arc. In addition to the usual scripting credit he was getting for Amazing Spider-Man during this era, J.M. DeMatteis also gets credited with providing the plot for Web of Spider-Man #122. Meanwhile, frequent JMD collaborator Howard Mackie gets scripting credit for “Smoke and Mirror’s” final chapter in Spider-Man. All of this is just a long-winded way of me saying that this arc has DeMatteis’s fingerprints all over it with its heavy emphasis on character introspection and internal conflict. And that’s a very good thing. If you’re going to sell a status quo shakeup as huge as “the clone is actually Peter and Ben is the real Spider-Man,” you have to set the audience up by making thoughtful and careful choices with your characters. “Smoke and Mirrors” has insight in spades. The arc opens with the Scarlet Spider swinging through the New York City skyline, thinking to himself that being a web slinging hero is something he can’t quit, even if he doesn’t believe himself to be a hero on the level of the “real” Spider-Man. This is such a subtle, but effective piece of storytelling. Ben swinging through the air looking for crime to stop could seriously be a throwaway scene, but the monologuing about the “draw” of superhero-dom proves pertinent later in the storyline when Jackal starts messing around with everybody’s heads by claiming who’s real and who’s a clone. Peter, meanwhile, is someone who’s psyche appears to be at its most fragile. He survives his brush of death (as featured in “Web of Death”), has been reunited with his wife, Mary Jane, after a rough patch, and is now an expectant father. Aunt May’s health is in doubt, but Peter and MJ remain beacons of optimism that she will somehow persevere and witness the birth of their child. In other words, things are going so right for Peter, yet emotionally and psychologically he embodies a man who is anything but okay. I thought the creators made an interesting character choice here when they cast Peter as the loose cannon/unhinged one once Jackal started to spout about clones. Ben manages to keep his calm, and urges Peter to stay cool in an effort to learn more about the Jackal’s schemes, but Peter flies off the handle, attacking Jackal, Ben and anyone else who gets in his way. When the Gwen clone emerges from the test tube, Peter is the one who goes with her to talk, as if there was any doubt as to whether or not this character is the real mccoy. Peter keeps claiming he felt Gwen die in his arms, but he is clearly a man who no longer believes what he sees, hears or feels anymore. He is a man whose world is in a constant shroud of doubt. Like one of Jackal’s poorly made clones, Peter’s emotional stability is degenerating. This high level of nuanced characterization is missing from the latter half of the “Clone Saga,” which plays a big role in why the storyline has become such a punchline in retrospect. For example, I remember when I wrote my Gimmick or Good column on Sensational Spider-Man #0 (the first official comic with Ben in the lead role) how I commented on writer Dan Jurgens’s lack of awareness of the character he was attempting to write. Jurgens attempts to cast Ben as a victim of a crime (his life being stolen) by an arrogant criminal (Peter), as if Peter and Ben were these two wholly unique characters and not carbon copies of each other. “Smoke and Mirrors” proves that Peter and Ben are not two sides of the same coin. Rather they’re two pennies, side by side — one a little more worn and weary than the other.